Behind every great gaming machine there's a divine GPU, hard at work. With next-gen options from both NVIDIA® and AMD, your detailed gaming environments await. Radeon™ RX Vega56 cards provide a complete enthusiast class gaming experience with powerful performance paired with the latest display technologies constructed for serious gamers. NVIDIA® G-SYNC®1 calms the storm of fast-paced gaming woes by eliminating screen tearing. With your G-SYNC™ Ready laptop, you're good to go. 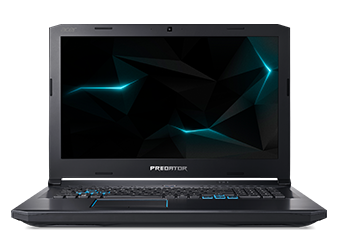 You might be streaming, editing or what many of us would do with a machine like this—gaming. With options from Intel® and AMD, you'll need a CPU that doesn't hold back. This 8th Gen Intel® Core i9-8950HK1 processor can be overclocked and utilises up to six cores and up to 12 threads to make all your CPU-intensive dreams come true. The AMD Ryzen™ 7 27001 processor—complete with up to eight cores and up to 16 threads—blazes through even the most task-heavy game sessions. You might start at 16GB but feel free to crank it up to 64. The question remains—how to find enough tasks to make use of it all! Fast systems need fast drives. Avoid potential bottlenecks by equipping your Helios 500 with up to two PCIe NVME SSDs1 in Raid 0 and up to 2TB1 of HDD storage. Feel the need for speed by upgrading memory or storage? Just make your way to bottom of the laptop to discover the easily removable bottom cover. Enhance and empower what you hear with some incredible tools from Waves MaxxAudio® to get the most from the 2.1 sound system. Goodbye mediocre, hello marvellous! TrueHarmony™ utilises a unique design for more accurate sound reproduction and fuller-bodied audio. Headphones or not, you'll like what you hear. Designed for headphone use, Waves Nx recreates what you hear for a 360° surround sound experience, whether it is movies, games, VR—you name it. PredatorSense™ is the ultimate tool for control. Take command over overclocking1, game profiles and more. Try not to get lost amidst all the settings. Killer DoubleShot™ Pro gives you an edge online by taking control over your network. Decide what goes in, what goes out, which programs get priority and more. Virtual reality. It's everywhere, constantly improving and beyond enjoyable. This machine is ready and able, so go ahead and jump on in. 1 Specifications may vary depending on model and/or region. All models subject to availability. 2 Supported keys include Q, W, E, A, S, D, Z, X, C, V, Left-Shift, Left-CTRL, Left-ALT, space and four arrow keys. Specifications may vary depending on model and/or region. All models subject to availability.